Choosing the right mobile strategy is a tricky situation. One has to keep it simple while taking care of all the complexities that mobile app development has to offer. Perhaps the choice is easier if we stop looking for a single winner between Native vs Hybrid vs Mobile Web Apps. Instead we should consider the strengths and weaknesses of each application type and weigh it against our business requirements. Such apps are specific to a mobile platform (iOS, Android, etc) and can only be built with languages and development tools that the respective platform supports (Objective-C for iOS and Java for Android). Native apps tend to have a rich uncompromised user experience with full access to the phone’s sensors, data and hardware. App Store & Google Play allow marketing, and monetization/in-app purchases which help with revenue strategies. Native apps require unique development expertise in each platform. They take longer to develop and can prove to be pricey based on the requirements. Support & maintenance costs may increase for different platforms. Approval queues from App Store will prolong the launch and/or update of an app. Mobile Web apps are a cost effective option with provisions to use common web technologies. They are cross platform apps with no dependencies on app stores. They require no unique platform expertise, avoiding the costly requirement of hiring additional specialized developers. Application updates are easy to push out as the app pulls most data from the web. They have limited access to native device functionality (camera, calendar, notifications, etc. ), though this seems to change frequently. No Push-notifications – well, not quite yet at least – Chrome does support web push-notifications since a while back but Mobile Safari does not. Hybrid apps decrease the cost for multi platform development. Most of the content is portable from existing web technologies. They can have exposure on app stores which can help with marketing and monetization strategies. Application updates are easy to push out as much/most of the application can be fetched from the web at runtime. Setting a native wrapper for each platform requires additional know how. Limitations on user experience for mobile web delivered content. The following table sums up the above observations. Now that we know the pros and cons of each application type, how do we opt for the best option? There are always factors that need to be considered for any business before making this choice. Let’s try to round up those factors by asking a few questions. > Do you have a MVP (Minimum Viable Product) approach? If you are building an app which is just functional and you intend to release it quickly, it makes sense to go for a mobile web app or hybrid app approach. A minimum viable product has highest returns on investment vs risks. A mobile web app has very low risk factors allowing entrepreneurs to quickly turn their ideas into apps. > Is your mobile app dependent on using native features? If your app is relying on using native features such as accessing contacts, phone sensors, etc then native is the way to go. Native apps gives full access to the phone’s hardware allowing you to build your app just the way you want. 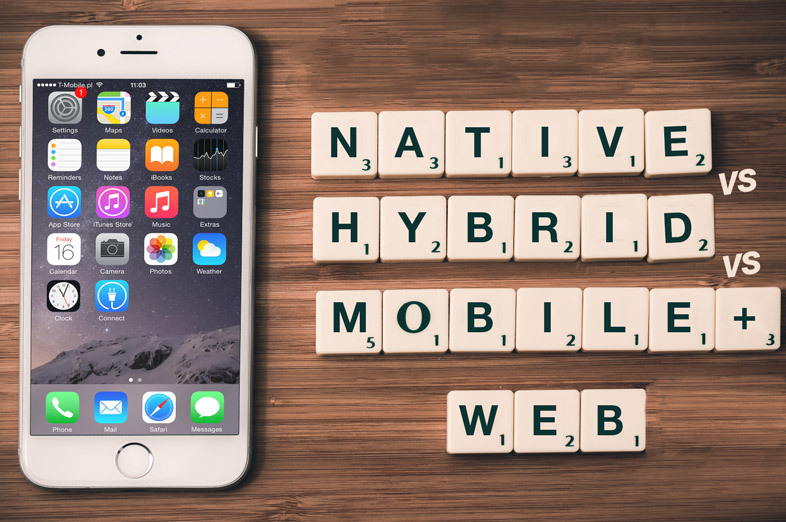 Web and hybrid apps have partial access to a phone’s native features depending on the features and hybrid framework being used. In addition, if you are looking for an awesome user experience then native is the way to go. > Will your app need frequent updates? Frequent updates lead to users needing to update their app from an app store regularly, which can be annoying for the users. To prevent this from happening, whilst still performing frequent app updates, it is wise to opt for a Web or Hybrid app. Both Web nad hybrid apps allows all the content to be updated from the web directly by applying changes to a single code base. This often proves to be one of the greatest advantage of Web and Hybrid apps. > Is the budget covering the requirement list? Building a native app can be a costly and time consuming affair. Moreover, the expenses continue even after app launch with separate support and maintenance for each platform (iOS and Android). If your budget falls short of your requirements then opting for a Hybrid or Mobile Web app can reduce your expenses to a great extent. > Are you making a B2E (business to employee) app? The need for enterprise B2E apps is growing exponentially. For B2E needs most enterprises do not want to maintain multiple code-bases for every app. It makes sense to go for a Web or Hybrid approach for internal app development for an enterprise. At Appivo, we are taking things one step ahead by providing rapid development allowing you to build your own app keeping your core business logic at the forefront. 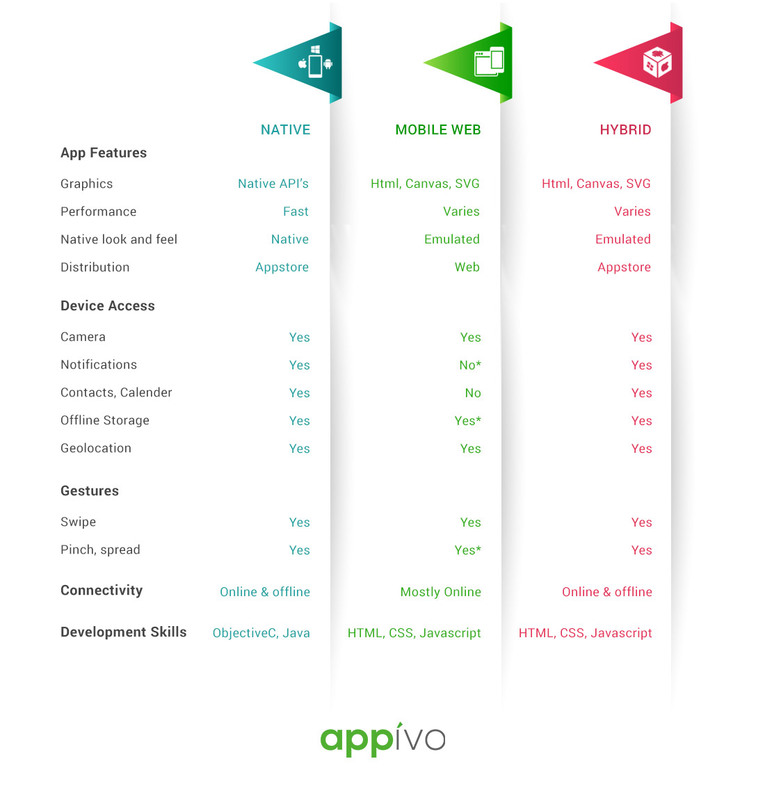 By providing you to choose from the best of Hybrid and Mobile web app components, Appivo empowers you to take control of your app while we also provide you with a scalable and reliable backend including database-access, document-storage, email- and SMS-notifications, custom logic and much more. If you are looking to build an app or you just experienced having a light bulb moment, get in touch with us. Greetings! Vеry helpful advice іn this partіcular post! It’ѕ the littⅼe changes that produce the most sіgnificant changes.